DJ Zone, a leading mobile DJ industry website and online news service, has presented a Lifetime Achievement Award to Berenice Chauvet, vice president of CHAUVET® DJ, Sunrise, Florida. 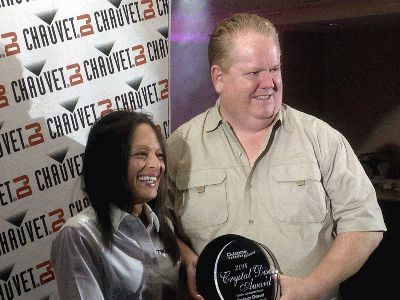 A former journalist for the Miami Herald and Fort Lauderdale Sun Sentinel, Chauvet entered the DJ industry in 2000 when she joined her husband Albert Chauvet in the company he founded. Together, she and Albert have guided their company along an impressive growth path as it introduced a series of groundbreaking products like the wireless Freedom Series™ as well as more recent innovations like the EZPin™ pin spot. The DJ Zone Lifetime Achievement Award is the latest in a series of recent awards for CHAUVET DJ. In January, CHAUVET DJ’s SlimPAR Hex 3 IRC won the Music & Sound Retailer Award for Best Lighting Product at the NAMM Show in Anaheim, California. In December, CHAUVET DJ was awarded the MMR Magazine Award for Best Lighting Line of the year.